You could walk 5 days to Baguio, with lots of stop overs at drinking and eating places. There are many people who want to be wealthy. But they are leisurely walking their way to wealth! There are investment vehicles to wealth and they are available to all. We just have to ride them! Banks are terrific for the everyday working of life, for depositing, and withdrawing and payments, and for keeping our spending money and emergency money. But if you keep your savings/investment money in a bank, you are like some one walking on their knees to Baguio! Join the TrulyRichClub and discover reliable and safe wealth vehicles! 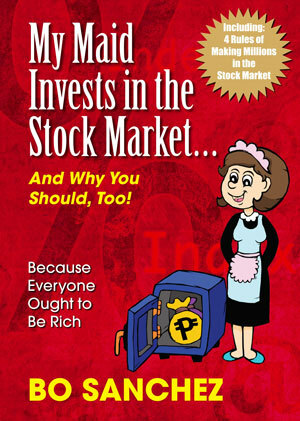 This entry was posted in Bo Sanchez, Financial, Truly Rich and tagged investment instruments, investment vehicles, vehicles to wealth, wealth vehicles on November 24, 2014 by Bobet Prudente.